This Menehune Shores Condo is unit #620 and is an oceanfront/oceanview penthouse, which has 880 square feet with two bedrooms and two baths. The master bedroom is on the oceanside of the building and has a King-size bed. The second bedroom has a Queen bed plus a pull out twin trundle and there is a sofa bed in the living room. Towels and linens are provided. Since it is a penthouse condo, it has higher ceilings (than the lower units) which provides a very spacious feeling. All rooms have ceiling fans. The kitchen has all the amenities including microwave, cookware, coffeemaker, and dishwasher. The dining area is between the kitchen and the living room. For your entertainment there is a 55 inch LED TV with cable and Blue Ray & DVD player in the living room. There ia also a 46 inch LCD TV with Cable in the master bedroom as well as a 20 in LCD TV in the second bedroom with DVD player only (no cable or broadcast). There is a washer and dryer in the unit for your convenience. There is a spectacular view of the ocean and shoreline from the lanai (outside balcony). The view includes the southwestern slopes of Haleakala Crater, three islands, and possibly humpback whales swimming along Maui’s western coast between the months of December and May. The grounds at Menehune Shores are well kept and the complex has elevators and a roof-top garden that is complete with barbecues, picnic tables, and lounge chairs. The heated, oceanside pool has an additional seaside barbecue area and is adjacent to the ancient Hawaiian fish pond which forms a great protected swim and snorkel opportunity. The Hawaiian Humpback Whale Sanctuary is our immediate neighbor and information on the seasonal whale population can be obtained there. It is also a great place to view the leaping, blowing mammals that visit us each year to give birth in the warm waters. This beautiful condo is centrally located for easy access to all activities on the 'Valley Isle'. 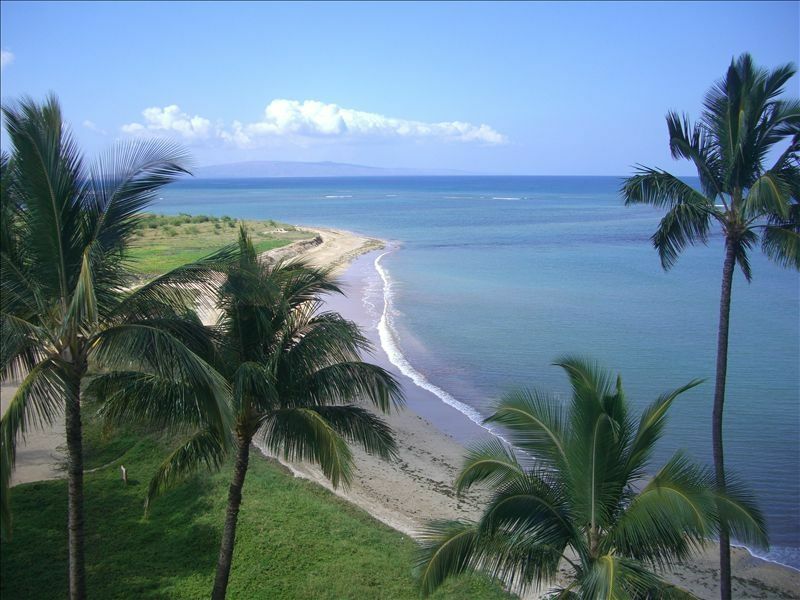 The front yard is six miles of pristine beach to run, walk and explore, true Maui style. There are six world-class golf courses a short drive from Menehune Shores. The Pacific Ocean Center Aquarium, where you can view the ocean's inhabitants through a walk-through glass tunnel, is a few minutes up the road on the way to the old whaling port of Lahaina. The exclusive hotels and shops of Wailea are just south of Kihei. You will find a stay in this condo to be a better value than in an expensive hotel! Please See Calendar for Available Dates. The owners chosen property manager on Maui will be available to handle any issues you have with the property . Should you have any needs while on island they are moments away to assist you. Their contact information will be available to you upon booking. We have traveled all over the world, however, we keep coming back to Maui. After about 10 trips to Maui, we decide this is the place we really want to be. We bought the property in June of 2011, while in Maui. I wanted to make it tropical and homey. I outfitted the kitchen as I would of if I was living there, and I love to cook, so I am constantly buying new items for the condo. We have collected a wide variety of staples that reside in the condo. We like to encourage our guests to use them, and feel free to leave your left overs for the next guest. Brand New April 2015- Full size washer and dryer. Beach Towels and Bath towels provided. Wide variety of spices, flour, sugar, coffee, etc. You name it--- We have it. Various family games and puzzles. We were very fortunate to have Chris here when we arrived and she gave us her “nickel” tour. This unit is absolutely fully furnished with everything we need including boogy boards and beach chairs! We had a great stay and were sad when we had to leave. We had a wonderful trip to Maui and Chris and Randy's condo is perfect! It was just the right size for my husband and our 10 month old son and my parents, we each had our own bedroom and own bathroom. The kitchen was well stocked and we enjoyed using the beach chairs, beach toys, snorkels and coolers that were in the condo. The location is so convenient for all the activities we did. The view is beautiful and we spent a lot of time out on the lanai. Thank you so much Chris and Randy for a wonderful place to stay! Amazing! Stunning! Incredible! THE BEST! What an amazing place this is to stay at! The condo is on the top floor so you have the absolute best view of the ocean. It is super quiet and you get an amazing breeze off the ocean. It is completely stocked with everything you need for your stay including beach equipment. The lagoon out by the pool was full of fish and sea turtles. My kids and I snorkeled there every morning. It was absolutely amazing! Uilaini’s shaved ice is right down the street. Do yourself a favor and go there every chance you get. You are centrally located between Wailea and Lahaina. We recommend Polo beach and the Old Lahaina Luau if you go. They were amazing. This is quite possibly THE BEST spot to stay in Maui. Thank you soooooo much Randy for your amazing condo! It was the absolute best family vacation we have ever had. Glad you had such a great time. We love Uliani's as well!!! This was our first time in Maui and we tried to do as much as we could. So Kihei was centrally located. The condo was clean and perfect. It had all the beach equipment that you would ever need. We would stay here again. The owners are very accommodating. Thanks for the great review. We try to think of everything.... So you don't have to. We like our guests to relax and enjoy instead of tracking down beach gear or kitchen amenities!!! We also love our location....very centrally located. So glad you enjoyed yourself!! !